When you like Science Fiction and you are a bit tired from a series of good books, which stops after part 4, then you are ready to start with Perry Rhodan. It stops never. It is just as infinitive as the universe. There comes no end. I started already many years ago with Perry Rhodan number 23. Shortly after I managed to get all the missing books and magazines. The cover on the right is from the very first Dutch Perry Rhodan. Now I'm the "lucky" owner of too many boxes, all full with Perry Rhodan magazines. 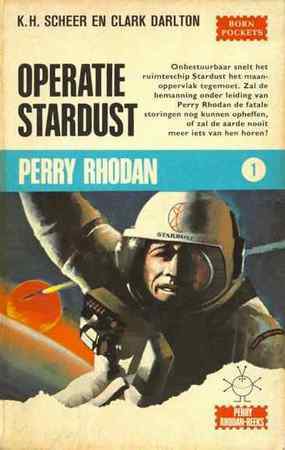 In The Netherlands, the series is supported by a Science Fiction Club, Perry Rhodan Science Fiction Vereniging SF Terra. 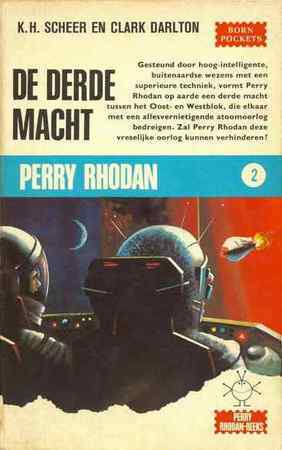 If you are Dutch and you like Science Fiction, but you don't like Perry Rhodan, then you can leave here. There is you find another Dutch Science fiction club. The Perry Rhodan science fiction series started in Germany in 1961. It 's a space opera that more or less follows the life of Perry Rhodan and his friends. There are a lot of space battles and all kind of super weapons. What makes the Perry Rhodan series unique is it's length: as of 2003, there are over 2300 episodes. Over 200,000,000 copies have been sold world-wide. The original series in German exceeds 150,000,000 words in length. What's Perry Rhodan all about? The main story line starts in 1971 - ten years into the future at the time of writing. Perry Rhodan and three other American astronauts are the first humans to land on the moon. Soon after their landing they discover a crashed space ship. It belongs to an alien race called Arkonides. Rhodan uses the vastly superior technology of the Arkonides to prevent World War Three and politically unites Earth as "Terra". Within a few years the Terrans have built their first own faster than light space ships and push into space. The universe, it turns out, is packed with intelligent races. Many of them have mastered space travel thousands of years ago and established huge empires. On one of his first trips Rhodan encounters "IT", an incredibly old and powerful immortal being. Granting the Terrans 20,000 years to embark upon their cosmic destiny and bring peace to the Milky Way galaxy, IT bestows Rhodan and his closest friends with immortality. To browse visit the WebRing..